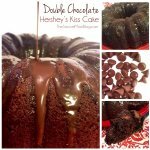 A double chocolate Hershey's Kiss Cake that the crowd will go crazy for! 3 1/2 cups Hershey's Kisses we bought the party pack so there would be more than enough for the recipe, plus some left over for snacking! Place 1 1/2 cups unwrapped Hershey's Kisses in a medium mixing bowl. Add 1 TB flour and toss until the chocolates are well-coated. This will keep the kisses from sinking to the bottom of the cake while baking. Add flour-dusted Hershey's Kisses to cake batter and hand stir until mixed throughout. Pour batter into a bundt pan (well-greased with butter, make sure pan is thoroughly covered so cake will release easily) and bake according to directions on cake mix package. (Our bundt pan was dark, so we baked about 45 minutes at 350°). Remove cake from oven and gently shake to release cake from sides of the pan. When cake is cool you can invert pan over a serving plate and cake should slide right out! For the Chocolate Ganache: Heat 1 cup heavy cream until steaming (but not boiling!) While cream is heating, rough chop 2 cups Hersey's Kisses. Add to medium mixing bowl. When cream is hot, add to mixing bowl with chocolate pieces. Whisk until smooth and shiny. (You can add more chocolate for thicker ganache or more cream for a thinner consistency, depending on your preference). Pour over cake — as much or as little as you'd like.